Norway and Denmark were united until 1814 and operated a combined navy. Naval weapons up to that date, including Boarding Axes can be considered part of that combined force although most of the arms were imported or made in Denmark, with priority given to Danish ships for new issue weapons. After 1814 Norway developed an arms manufacturing industry at the silver mining city of Kongsberg. The silver mines were almost exhausted so Kongsberg Våpenfabrikk was started in order to re-employ the many available silver miners and smiths. The first weapons were produced in 1818 and were notable for their very poor quality, which gradually improved over the following years. The newly formed Norwegian arms industry based some of its weapons on British models, perhaps to distance themselves from their former partners. Specifically the 1820 cutlass, which is indistinguishable from the British 1804 pattern save for the markings, was copied as was the later 1845 model. 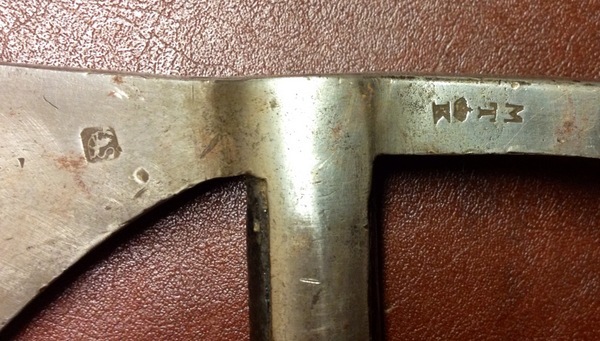 Kongsberg produced Boarding Axes of their own unique design with side langets notable for their length. They produced two very similar models in 1825 and 1855 both of which are normally well marked with the Norwegian lion, inspectors’ marks and the crowned K. These axes gradually replaced the Danish models that were in service when the countries separated. The 1825 model came in two sizes of shaft - long and very long - and included extensive integral side langets, which at 42 cm were over half the length of the handle on the standard size axe. The spike is four sided and approximately 13.5 cm long. The last model of boarding axe is very similar to its predecessor but is much reduced in length and head size, with the spike now being 10.5 cm. The langets are also shorter being, at roughly 25 cm, just less than half the length of the handle. There is no longer handled version and the later model was considered to be of much improved quality. The axe reflects the changes to naval engagements and was the last regulation Norwegian axe. These three long handled boarding axes are in museum collections in Norway and date anywhere between 1650 and 1800 but may have remained in service for many years. They perhaps reflect Norway’s lack of early arms industry and their prowess as privateers. Chisel, flared and bearded! British, Swedish, and Danish perhaps. This may be a direct copy of a British axe including side langets, but is more likely to have been captured from the British and re-hafted with a longer handle. Again this could be a copy of a Swedish design or a captured weapon. Danish long handled Model 1 version probably in use in Norwegian ships for longer than in their Danish counterparts. The last Danish model of boarding axe was also used by the Norwegian navy and some think that it was also produced in Norway as well as in Denmark. Photographs on this page courtesy of Norwegian Naval Museum or Kongsberg archive unless otherwise marked.